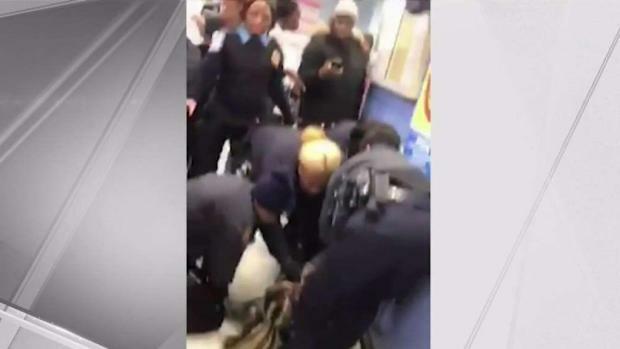 A mother jailed after police violently pulled her toddler son from her arms in a videotaped encounter in the crowded waiting room of a New York City social services office has agreed to do community service to resolve a separate legal case in New Jersey. 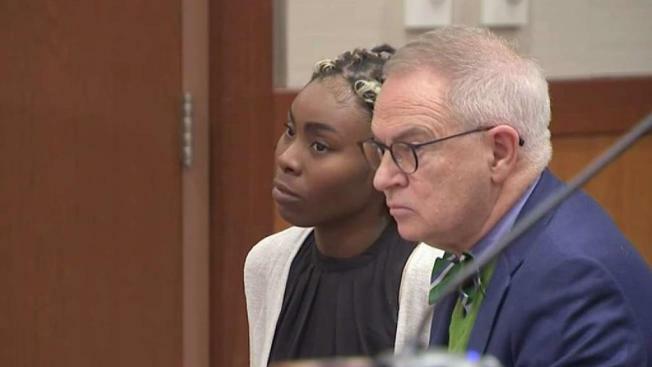 A judge on Tuesday ordered the release of Jazmine Headley, hours after Brooklyn District Attorney Eric Gonzalez said that "in the interest of justice" he was dropping all charges against her in Friday's incident at the social services office. Headley, 23, was still being held on a warrant in an unrelated credit card fraud case in New Jersey after her release from Rikers Island, but a judge on Wednesday told her that those charges would be dropped if she successfully completes an intervention program. Judge Peter Warshaw said Headley will have to pay back about $1,000. Her agreement also includes 20 hours of community service. After she was released from Rikers on Tuesday, Headley told reporters that, "All the support that I've been getting in New York, all the great people... all the love, and I'm accepting it, I'm just so grateful." "I'm just happy to be free, and I just need to see my boy," she added. Headley had faced charges of resisting arrest, criminal trespass and other offenses stemming from the caught-on-camera fracas on the floor of the Human Resources Administration office on Bergen Street last week. 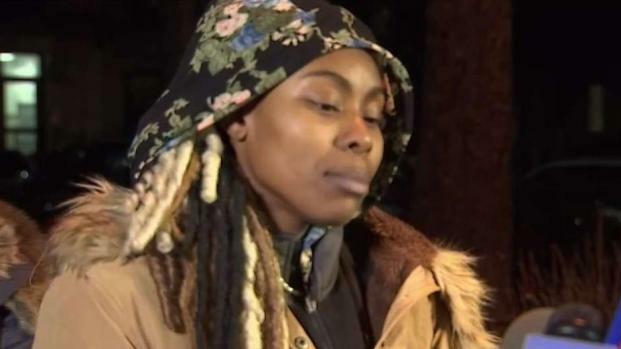 The video, which showed her surrounded by officers trying to grab her baby as she clutched him to her chest, wailing, stirred outrage across the city and beyond. On Wednesday, Mayor Bill de Blasio — who was criticized for failing to make a public statement about Headley in the days after her arrest went viral — called the incident "deeply troubling." "This should never happen. It will never happen again," he said. "Common sense tells you you don't treat a mother and a baby that way." The Brooklyn DA has dropped charges against the mother seen on video desperately trying to hold onto her son as officers tried to wrestle him away. But outrage continues to grow. Andrew Siff reports. The mayor said he wasn't able to speak out about the arrest until he'd spoken with the NYPD and HRA. He also offered an apology to Headley on behalf of the city. "Not only am I outraged as a parent, I'm disgusted," he added. Brooklyn District Attorney Eric Gonzalez said in a statement earlier, "Like everyone who watched the arrest of Jazmine Headley, I was horrified by the violence depicted in the video and immediately opened an investigation into this case. It is clear to me that this incident should have been handled differently. Continuing to pursue this case will not serve any purpose and I therefore moved today to dismiss it immediately in the interest of justice." "The consequences this young and desperate mother has already suffered as a result of this arrest far outweigh any conduct that may have led to it: she and her baby have been traumatized, she was jailed on an unrelated warrant and may face additional collateral consequences." The NYPD has called the video "troubling" and said it is reviewing the encounter. In New Jersey, Headley and two other people had been accused of making or using a dozen credit cards printed with numbers and names that didn't match their magnetic strips and having a driver's license that didn't belong to them. Police officers pulled a 1-year-old baby from the arms of a mother in a social services office in Brooklyn. The NYPD called the video "troubling" and said they would investigate. Headley's lawyer maintains she wasn't involved in the theft, but was in a car with a man who stole cards. Lisa Schreibersdorf, the executive director and founder of Brooklyn Defender Services, said the group was "filing a special application to ask the judge to release her on the New Jersey matter" on Tuesday. At one point in the footage taken inside the HRA office, an officer is seen forcibly ripping the child from the mother's arms, but Headley doesn't let go. Other people in the crowded office screamed, "Oh my God!" and "Look what they're doing to her!" Outrage is growing over a video showing NYPD officers ripping a baby out of the arms of a mother at a social services office in Brooklyn. Gus Rosendale reports. 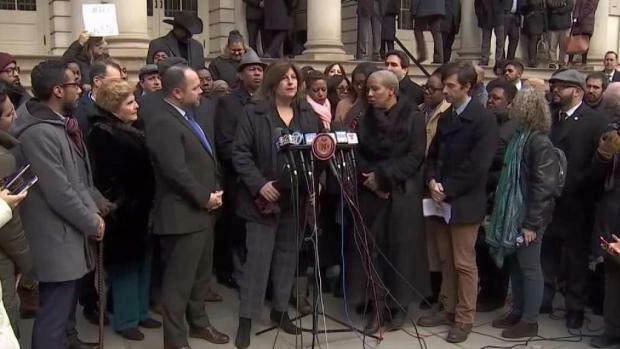 “Being poor is not a crime," Public Advocate and Attorney General-elect Letitia James said. 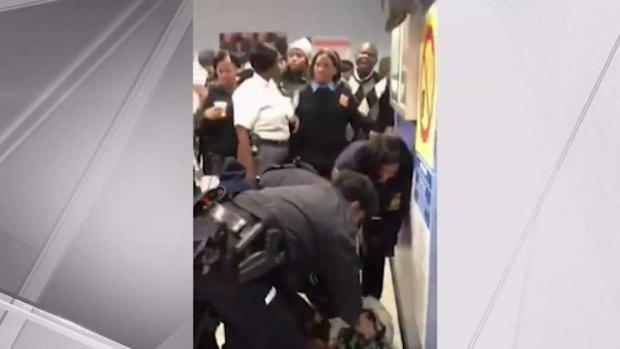 "The actions of the NYPD in this video are appalling and contemptible." "No mother should have to experience the trauma and humiliation we all witnessed in this video,” she added. Department of Social Services Commissioner Steve Banks appeared to agree, saying Monday that two peace officers from HRA were put on leave and will be placed on modified duty when they return to work pending the department's investigation. "I can't believe the NYPD, how they handled it, the force of what they did to grab my grandson like that," she said. "He was like a rag doll." It is shocking video that has some across the nation in disgust and now there is new fallout for the peace officers seen prying a baby from a mothers arms at a government office. Ray Villeda reports. She continued, "Maybe she should have given the baby up. But understand if they gave her space, she would have gone up and left." Schreibersdorf called it a "violent encounter where the child was being used as a pawn." Patrick Lynch, the president of the NYPD's rank-and-file union, said in a statement Monday that officers were put in an "impossible situation." "They didn't create the dispute at the HRA office -- as always, they were called in to deal with the inevitable fallout when the rest of our City government fails in its task," he said. He added, "The event would have unfolded much differently if those at the scene had simply complied with the officers' lawful orders. The immediate rush to condemn these officers leaves their fellow cops wondering: when confronted with a similar impossible scenario, what do you want us to do? The answer cannot be 'do nothing.'"